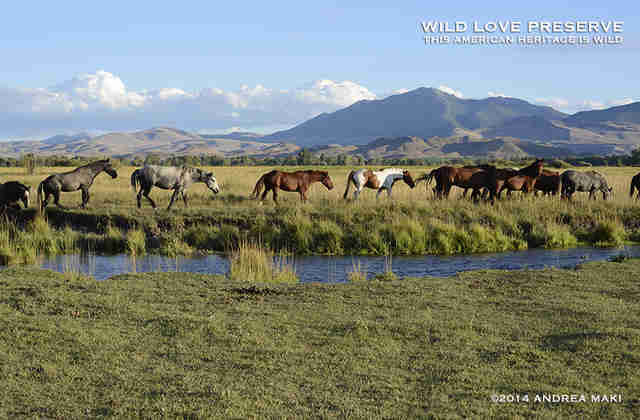 Wild Love Preserve (WLP) was founded in 2010 and ever since has been at work to secure the lasting freedom and preservation of Idaho wild horses on their home turf. This is the story of how we rescued every Challis wild horse the Bureau of Land Management (BLM) made available as result of their roundup and removals in 2012. Shared with this story are three special Project WLP videos. The 2012 BLM Helicopter Roundup on the Challis Herd Management Area (HMA) resulted in 150 wild horses being permanently removed from this 154,150 acres of wild public lands, leaving an estimated 185 Challis wild horses on the range. WLP was present during the roundup and immediately put in motion development of a community focused program to address the Challis wild horses removed as result, that would not be adopted otherwise. Subsequently, and a first, not one Challis wild horse displaced in 2012 was shipped out of the state to BLM longterm holding facilities. Wild Love Preserve brought all sides together to create the WLP Adoption Project, resulting in an evolving success story. As of Summer 2013 WLP has purchased and adopted 130 Idaho wild horses, to include 22 babies born to our wild Challis mares already pregnant at the time of their adoption. By way of private supporters Project WLP has rescued and removed these native Idaho wild horses from the existing taxpayer funded system. This is the second largest adoption in BLM history, however first of its kind in intent and action. Thanks to unprecedented teamwork, we have secured these wild lives in a new manner to remain forever together on permanently protected WLP native wild expanse on home turf in Idaho. This 2012 Challis Helicopter Roundup was in October, adoptions began in December, along with WLP's purchase of all older authority horses, and our mass adoption took place during the first half of January 2013. Because a mass adoption like this had never been done before, there were many twists, turns and challenges faced to meet BLM requirements, including specially modified corrals and other site-specific logistics. As per the system, the BLM monitors adopted wild horses regularly for a year, before adopters take ownership. On January 17 and 18, 2013 it was on! The excitement filled the air and the wild horses knew it was their lucky day! All logistics were in place, trucks and trailers and folks from every side of the wild horse issue were at the ready. It was tremendous to arrive at the Challis Wild Horse Corrals knowing that every single horse had a golden ticket out and were officially saved. Trailer after trailer, we loaded everyone up and drove them an hour away to WLP leased corrals. Our third move happened on August 30, 2014. 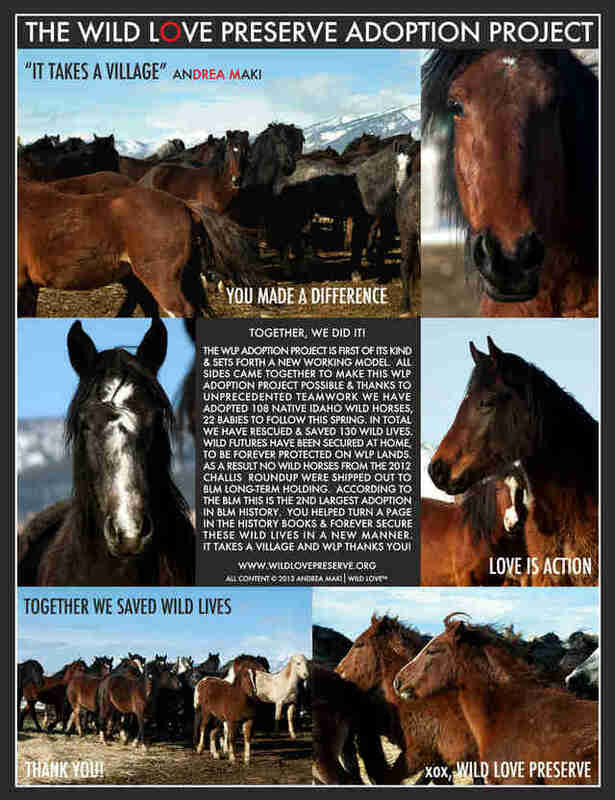 Forever in our hearts and souls, this day proved to be nothing short of remarkable as we turned out our 130 rescued Challis, Idaho wild horses from 18 months in BLM required corrals/pasture to 400 acres of wonderful, green, open pasture with year round water. The magic and wildness that filled the air was absolutely electric! Watch the videos below to feel and hear their joy! And so began this third phase. Upon turning them out, wild instincts kicked right in and they were over the moon about being all together again - wild geldings and mares and yearlings. No words can express the relief and exhilaration of witnessing these wild wonders back together after being separated since the October 2012 Roundup. Their patience had been truly extra-ordinary. This 400 acre leased pasture is one step closer to their lasting freedom back on native rangeland. Immediately they were mixing and mingling in their chosen bands, yet still one big family at the end of the day. Boys busy rallying the ladies, the ladies trumping certain wishes of the boys, and our littles now yearlings experiencing the sheer joy of running like the wind, kicking up their heels, playing and grazing amongst their family and friends. Most important, all of the strong family bonds created are lasting and forever. These Idaho wilds are free to be and do as they choose, just as on the open range. Project Wild Love Preserve's preservation of this wild American icon is legacy project. 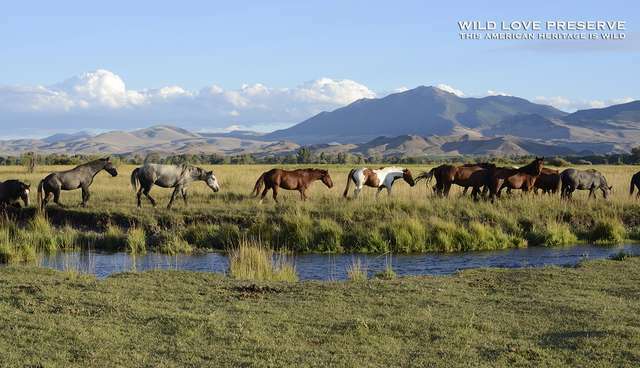 Our adopted Idaho wilds and their offsprings will live their lives together on WLP wild expanse in their native region, allowing family bands and dynamics to be established, nurtured and permanently protected. That which we do today sets the stage for future generations to equally nurture, treasure and experience. Wild Love Preserve is about the whole and for the whole - past, present, future.